The First Lady is putting her imprint on the festivities tailoring the activities to promote health and wellness keeping with this year's theme “Let’s Go, Let’s Play, Let’s Move!” Michelle Obama's signature "Let's Move" initiative tackles the problem of childhood obesity. 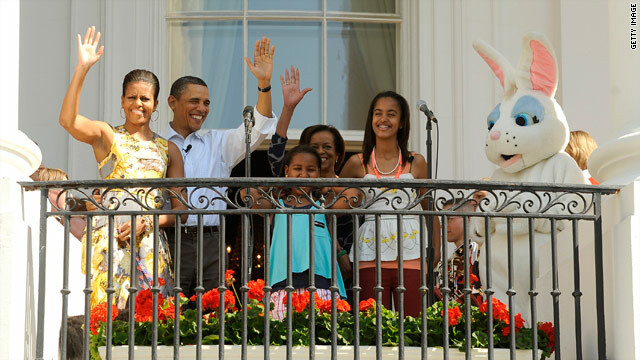 In addition to the traditional rolling of the Easter eggs on the South Lawn, kids will be able to play on sports courts, participate in dancing and cooking activities all geared to encouraging a healthy lifestyle. As for the entertainment, The White House is planning to release the Easter Egg Roll talent they've booked all week via @LetsMove on Twitter to build the excitement. In past years Justin Bieber, Colbie Caillat and the cast of the television show "Glee" have performed. Guess we'll just have to wait and see if "the Bieb" makes a return performance this year! What a fun day. This is a tradition that goes back a long time but the Obamas have made it very special. Lets see what the repo jerks have to say. Can't seem to let a positive story stay positive, huh?